AIRPLANES and RACE CARS --use NITROGEN to inflate their tires because of the many performance related benefits NITROGEN provides. 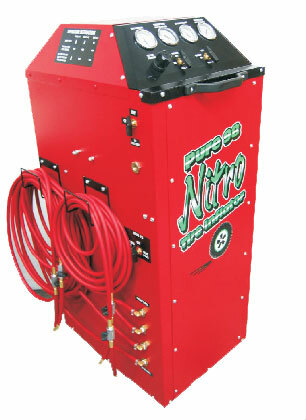 PREVENTS LOSS OF TIRE PRESSURE --due to oxygen escaping at a rate of 1-2 PSI per month. 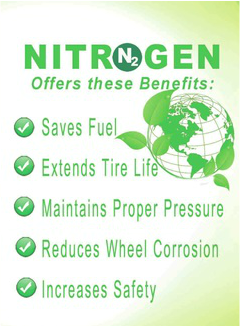 The NITROGEN MOLECULE is 4 times larger slowing down its migration through the rubber tire wall. PREVENTS TIRE PRESSURE ADJUSTMENTS that will be necessary with the New TPMS (Tire Pressure Monitoring System) due to daily and seasonal temperature fluctuations that impact the moisture causing it to contract and expand. NITROGEN does not hold any moisture. PREVENTS PREMATURE TIRE FAILURE --and failure due to improper tire inflation. 80% of all tires on the road are improperly inflated. COOLER OPERATING TEMPERATURES --improperly inflated tires increases heat build-up which leads to ply separation in tires. IMPROVES FUEL ECONOMY -- properly inflated tires match the road surface as the manufacturer designed, & roll with less resistance. PREVENTS RUBBER "CORROSION" --oxidation due to the oxygen & water permeating the rubber tire from the inside.